The first walk was at Douglas S. Westgate Conservation Area located on Papermill Road. It was a slightly rainy day but eight participants still showed up. Walking along the retired cranberry bogs, Hyland and Malcom Phinney, board member of the Wareham Land Trust and a member of the Wareham Historical Society, discussed Wareham’s commercial cranberry history and how this industry affected labor laws in this region and across Massachusetts. 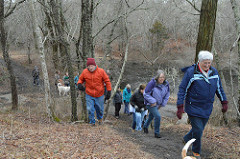 As the group made their way to the Weweantic River, Phinney shared the history of a Paper Mill that used to operate on the property, which led to a discussion of how rivers fueled the industrial movement in Wareham. The following Tuesday, Wareham was hit with an icy March blizzard. 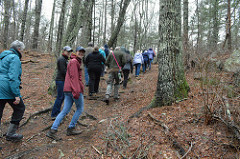 Still, a group of four hardy participants met at Myles Standish State Forest headquarters the following morning for the second Wednesday Walkabout. Despite a few patches of snow on the ground and chilly temperatures, it was a beautiful day to walk the 2.3 miles around East Head Reservoir. Hyland shared how State and National Parks were established as part of FDR’s New Deal. As the group strolled through the pitch pine forest, Hyland explained how this major recreation area was essentially built by the Civilian Conservation Corps, a result of the New Deal that provided hundreds of jobs for men after the Great Depression. 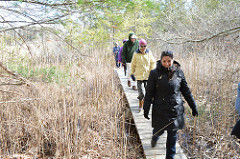 On the third Wednesday, fourteen participants met Hyland at Wareham Land Trust’s Tweedy & Barnes Conservation Area. As they meandered the trails, Hyland discussed how Wareham’s unique soil was formed by a massive glacier that once covered the land. He also pointed out how that soil determined our natural resources including cranberries and bog iron, which were both major players in the town’s industrial history and inherited landscape. 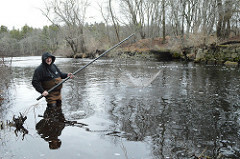 As they stood along the shores of the Sippican River, Hyland discussed the Wampanoag presence in the region and addressed the historic decline of river herring due to commercial fishing and dams. The tour was capped off with a quick chat about the future of Wareham and the role conservation can play in protecting natural resources and preserving history. 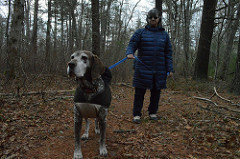 The final walk was held at Buzzards Bay Coalition’s Horseshoe Mill property. The seventeen participants got a tour of the 34-acre property and heard from Hyland and Phinney how this property was once home to a nail factory, followed by a horseshoe mill. They pointed out how evidence of this use can still be seen in the stone foundations and walls disperse d in the woods, the concrete dam that spans the Weweantic River, and pieces of iron slag that can be found on the ground. Phinney, a Wareham resident, shared personal stories of the site and his knowledge of how native Wampanoag used this land while traveling to and from the Cape. 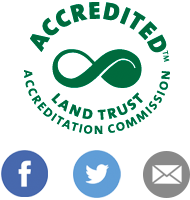 Hyland also added the conservation history of this property, which was once owned by the Wildlands, but is now owned by the Buzzards Bay Coalition who has plans to restore the riverway.